Even the most ardent smoker will confirm that entering a house which reeks of stale tobacco smoke or cooking smells is not something that is guaranteed to turn them on. Sprays often work for only a very short time and at best just mask the smell for a few minutes. However at Shiva we do have an answer in the form of our 16oz Headshop Candles which are supplied in no less than sixteen pleasant fragrances. You can be absolutely sure that our candles will produce a delightful scent that will cover up even the strongest of smells. Utilising a clever double wick system, the candles will burn evenly and produce a powerful fragrance. 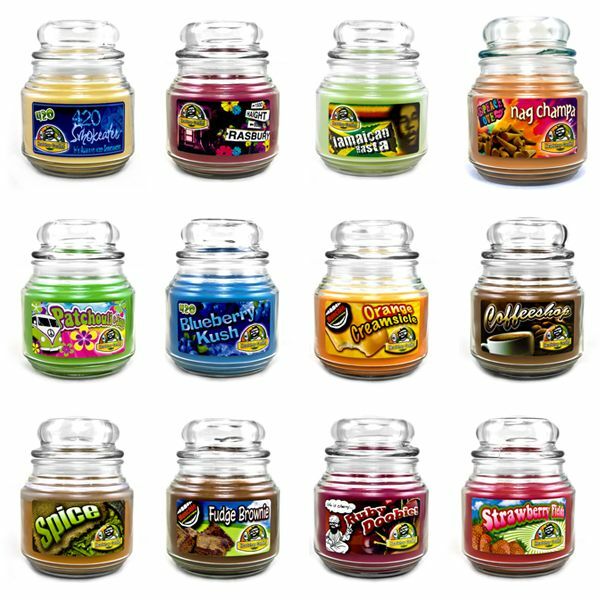 Headshop candles have been designed to eliminate unwanted smells and replace them with the beautiful scent of your chosen flavour. You could be spoilt for choice regarding the fragrances too, each one as gorgeous smelling as the next. How does chocolate chip cookie take your fancy, perhaps you and your partner may prefer coffee shop or fudge brownie, very popular recently has been Jamaican Rasta. Whichever one of the sixteen fragrances you choose, you can be absolutely sure that your home will be clean smelling and inviting, for you and your guests.